Interestingly, this upper tendon is the least important of all the tendons around the eye because Ellie can adjust her head in order to look up; peripheral and downward vision are much more important for anyone. However, when she did look up with one eye remaining straight, two separate images were then sent to the brain and we noticed certain activities and movements were challenging for her; such as, tripping, bumping into people or objects, and resisting school work that included transcribing from blackboard to paper. Her surgeon, Dr Kraft is a specialized pediatric Ophtalmologist. We were extremely fortunate to have access to his skill and for Sick Kids Hospital's extensive services. Ellie became a patient at 8 months old. Appointments may last several hours; including Occupational Therapy, drops and then her appointment with Dr Kraft. She always enjoys the videos and games which are a part of her consult. Sick Kids staff have patience, humour and use imagination to get the best response from their little patient. As parents, we decided that the best hope for Ellie would be to have surgery with the intention of correcting the weak eye and bringing it in line with the good eye. Glasses and patching would not work for her and we knew that as time went on she would lose her vision in her weak eye because her brain would ignore the messages sent by it as the good eye would overcompensate. As a young patient, Ellie is thankful to know that when she goes in for surgery she will go to sleep by way of a bubble gum flavoured gas rather than a needle. She is happy to be allowed to take her favourite stuffy and know that she can pick a parent to be with her for the first few minutes in the operation room. 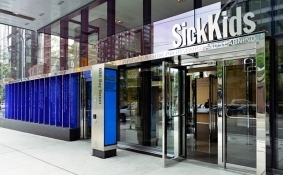 Sick Kids understands the stress in which parents are under during a child's surgery and the staff are very calming and helpful through pre-op visits and waits. After five years of monitoring her eye and performing two surgeries we are pleased to report that her eyes are now very well aligned. Ellie will continue to strengthen her weak eye simply by using it over time. We have noticed, physically that she is more aware of her depth perception and that she struggles less with transcription. She does not have that "goggly" look as she did for the first few years of her life. She is now able to rotate her eyes as most people do and at 6 years old she can roll her eyes when frustrated and this is good to see.